I went to an open house set up by SDOT and the city of Seattle at the Lopez room at Seattle Center today. They were outlining what will happen to Mercer Street west of Dexter after the new changes take place in South Lake Union. I took the kids. They were the only ones and not at all welcome. I say: this is real representative government and if you want 20-30 somethings to take part it political discourse, you have to allow toddlers. Roy doesn’t go through as a bicycle corridor. You have to take Roy to Dexter. Left and then right onto Mercer on the planned wide sidewalk (16ft, currently 5), then right on Taylor and left up Roy. Also, Gates Foundation is pushing for the curved alignment that would make a steeper grade in and out of the Mercer underpass. There was some talk by engineers present about making the sidewalk less steep and have it not completely follow the contour of the street. I hope that is the case. At this point, there are no bike lanes planned for Mercer Street between Dexter and 1st Ave N. The assumption is that cyclists will flip to Roy and then come back onto to Mercer at Queen Anne Ave where the bike lane will continue to 3rd Ave W. There will be no bike lane between 3rd Ave west and Elliott Ave. Studies will be performed to determine if another uphill lane can be installed on Mercer Place but one source at the meeting told me that cutting back Kinnear Park to make way for a transportation enlargement is a non-starter with the city of Seattle. I can’t really determine at this point what the city has planned to fix the gridlock that will be placed at the corner of new Aurora and Harrison, where the new off ramp will be. 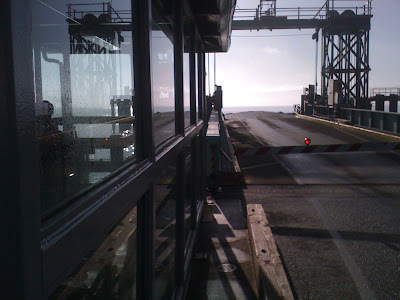 I was also met with smirks when I asked where the toll booths are going to be placed. The best reply, besides “that’s not my area…….” was that they will take pictures of your license plate and bill you every 6 times you go through the tunnel. Nice idea but don’t people get out of red light camera tickets by just stating that they were not driving their car? Will that loophole be changed or will the city just collect tolls from the honest people? What about out of staters? So my reply to the license plate photography was “that will go over great with the tea partiers” which brought stunned, deer in the headlights, looks from people. Should be interesting, but it will look so much better and much less complicated if Aurora just has a series of stoplights starting at Roy. This, my friends is an NFD, a National Forest Development Road. 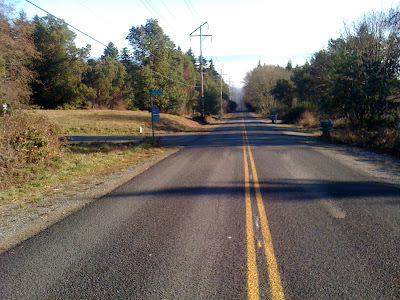 These roads criss cross Oregon in every imaginable path and may be the reason that Oregon can lay claim to the best cycling in the country. Sure, you've heard about Portland and all of their bikey, crunchy, velo ways, but that is relegated largely to inner east side flat land riding that depends on grid-like street patterns set on a very gentle grade. NFD's are the exact opposite of any road I've been on. They are paved logging roads; paved because the federal government made a lot of money from timber sales in Oregon and gave it back in this way so as to spur tourism, or sight seeing, or development in the back country or whatever. I'm glad they did, because Oregon seems to have hundreds of miles of 1.5 lane paved roads that see less than 10 cars a day. It's amazing. And even better, these roads don't just form a pass through the mountains. No, like a good logging road, they access as much of the mountain as possible, so you go up steeply and then you meander around the tops of these mountains, climbing and dropping, enjoying the views, and then rushing down into the next valley as steeply as you got there. In Washington, the mountains have not been as developed (read: exploited?) so there are only a few super highways through the mountains and the rest is private or public gravel roads where you might think that you need a Fargo or even a Pugsley. 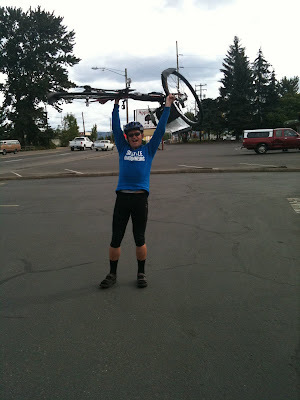 The Oregon Randonneurs organized a ride on August 28th and 29th of this year and as I pored over my schedule, I realized that if I wanted to do a 600k in 2010, this would have to be it. The only trick was that this ride would require some serious travel to get to and from, logistics for night time stays, and would cost a comparative arm and a leg to the SIR offering on September 11th. So, we made a big weekend out of it. 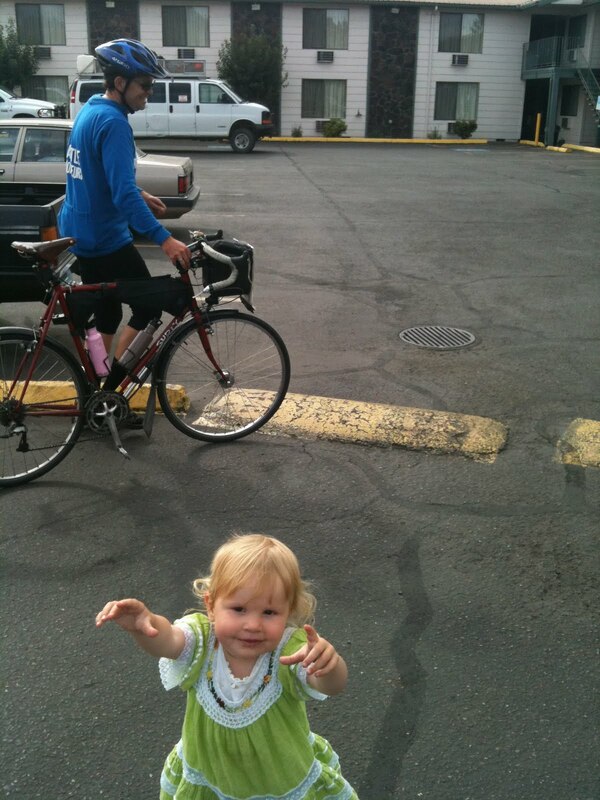 Claire had some clients to go visit along the way in Olympia and Eugene, we both have family in the Willamette Valley, and there was this super big ride scheduled for Saturday and Sunday. In the photo above, we are visiting my high school and seeing old sights from my salad days. 600 kilometers works out to 374 miles and so to maximize our daylight, the ride start was set for 5 AM, Shanico Inn, Lebanon Oregon, be there or be square. Our hotel was 21 miles away in Corvallis with nice access to a college campus where I could ride around with my son and goof off with family so I pre-rode to Lebanon starting at 3 so as not to wake the kiddies and mess up anyone's schedule. 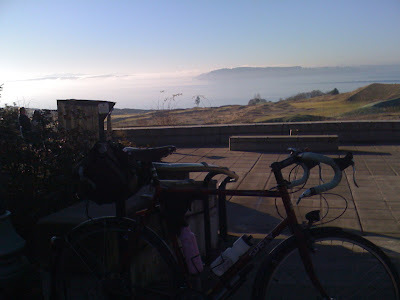 I really like riding to the ride since I know that I don't have to worry about tying up a car, and it gives me a sense of self reliance as well as a quasi spiritual mental preparation for the day. It also connects the ride in my mind to my home, or in this case, my hotel room, and makes it more of a journey rather than a race or event. Of course, that all can change if I wuss out, but you get the idea. Above, you see Ian Shopland and Steve Barnes in the foreground. Steve had contacted me about getting a ride home to Seattle and he looks fast so I figure, no problem. Ian is a known fast quantity so I'm hoping to hang with him for a while since his conversations are always so charming and go with the flow. Then I expect to get dropped for a couple of hundred miles and then end up here at the Shanico, preferably while the sun is still shining, the very next day. I arrived at 4:30 AM at the Shanico and chatted with others getting ready for the ride, became a member of Oregon Randonneurs (I'm now a member of RUSA, Seattle International Randonneurs, Adventure Cycling, Bicycle Alliance of Washington, Cascade Bicycle Club, Feet First, and now, Oregon Randonneurs, man what a joiner!) paid my fee, learned the handshake, and then listened to the pre ride ammendments and report. Everyone's pretty giddy at this point and I'm obviously not paying such close attention because I'm snapping photos. But it's pretty exciting. This is my second 600k attempt. 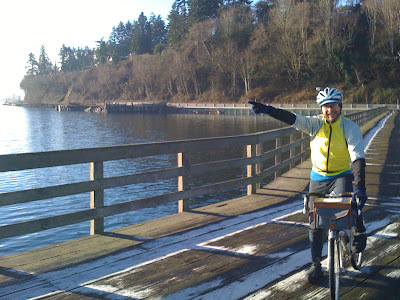 The first was in 2007 where I tried to ride clockwise around the Olympic Peninsula with SIR and had a crisis of conscience and of knees in Aberdeen. 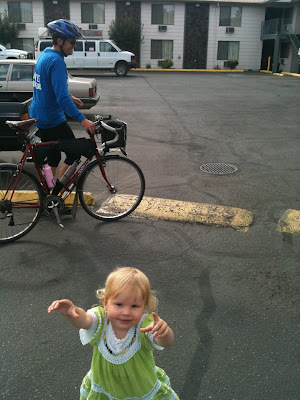 I had called my wife that fateful morning and that DNF has hung over my head for 3 years while I found time to get back into randonneur events while juggling my lovely little children. Everyone has slightly different gear choices. Pictured here, Susan Otcenas is checking up on changes to the route sheet. Right after that photo was taken, a control volunteer found my keys, which I had left in the room. I went to pick them up and then all the riders asked as if in unison "what do you need keys for?". I paused, noted the 2 lb u-lock on my bike which would be rendered useless without the keys but which would also contribute very marginal utility on the ride, and put both in my drop bag, a bag that would be lovingly lugged to the over night control at mile 230, and then lovingly lugged back to the Shanico the next day. Susan wryly noted that "there are no extra points for extra weight". I'm a guy who carries kids, groceries, cellos, tuxedos, and music stands around on my bikes so I hadn't really delved into weight concerns in a while, but it seemed like a good idea and thus, I rode lockless, keyless, and full of lift. This is the paceline for the first 20 miles. Yes, reflectors are not only prudent, but required. That's the same Susan two riders up with a very excellent reflector set up. Directly in front is Eric Ahlvin and to his right, Vincent Sikorski? That's an Endless Mountains 1200k jersey so that might help in identifying. Like I said, this is my first 600k so I may not have all the names completely straight. The early paceline is chatty and fun and I have nice conversations with Geoff Swarts, Gary Prince, David Strong, and others while we roll through the flat farm roads surrounding Lebanon, Albany, Tangent, and Corvallis. The Willamette Valley is one giant glacial field, filled in by sediment from the Willamette River. It's pretty flat, extremely fecund agriculturally, and features rocky outcroppings of glacial till that we ride around rather than over. It's a very nice section and the sun comes up as we roll into Corvallis. This is my attempt at getting a photo of the many lights behind me. Everyone has a well developed idea of what bicycle lighting should be and it's fun to see the outcomes. This photo features my helmet, but you get the idea. Here's what I assume to be the last of Ian Shopland as I get dropped off the back of the fast group paceline before Veneta. It had to happen at some point. The control at Corvallis was extremely nervous and full of tension as everyone tried to be in the "fast" group and not get dropped. I had to sprint for a couple of miles as I did most of my shopping at the control that also was a Safeway. 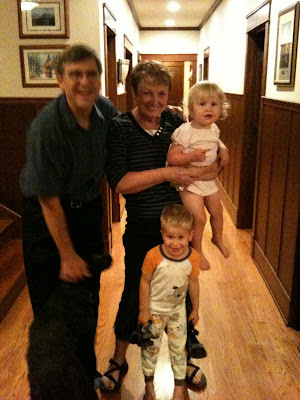 Once I found some of the people I was looking for, Gary, Ward Beebe, Ian, Susan, Steve Williamson (he has a wonderful blog), and others, we formed a more tight knit group and enjoyed the rolling hills southward. Where are these headwaters, anyway? 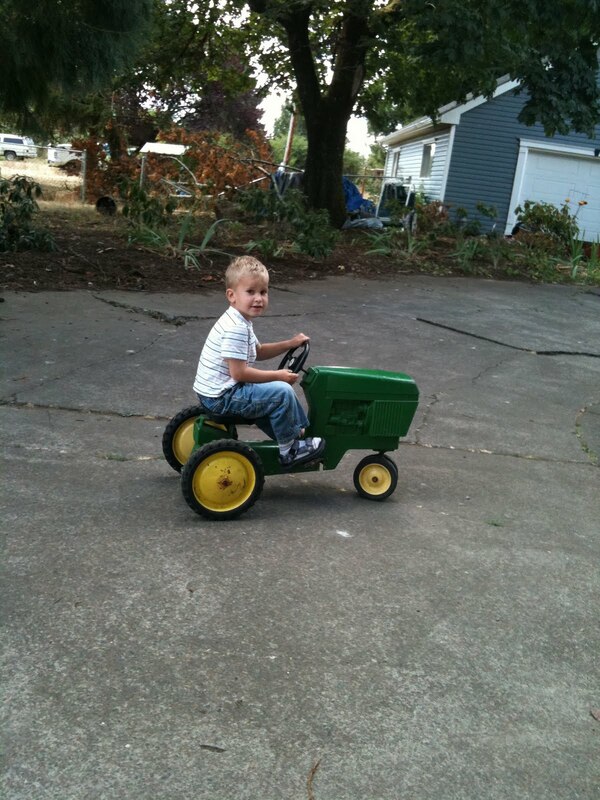 Meanwhile, my son, Thorvald, is exploring his agricultural proclivities in Junction City, very close to where I am presently riding. I just had to include this one. Cameras with time stamps are so fun because my wife and I will concomitantly take photos of our exploits and then they end up in Iphoto sorted by time rather than device. It's nice to see what's going on while I'm having a great ride. 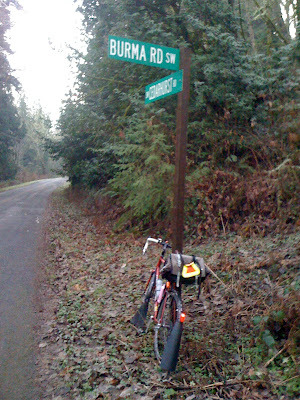 After Cottage Grove, where I checked in with Gary and Ward who were just leaving and where I got passed by Ann Trason and Cal Andersen, two fast and forthright randonneurs from Berkeley CA, I rode by myself from there, past Dorena, (dam, lake, then town) and up to my very first headwater! This was easier said than done and imagining this road to be a standard pass that goes through a saddle in the mountains and then directly down to the next town, I didn't pick up water at the campground posted as the only water between Cottage Grove and Oakridge. Luckily, it was cool and the roads were wet so I didn't need more than the full bottle I had with me. Soon, I was passed by a very jovial Greg Olson (pictured above), who regaled me with war stories of climbing this and other NFD's, their very history, possible future, other avocations, family stories. I particularly appreciated his answer to my question of what else he does with his life. He responded, "oh, I just ride my bike. I'm retired. It's nice". Right now, I can't imagine a life without poopy diapers, let alone a job! And I said "what? how does that work?" This photo also shows my surprised dismay that erupted after Greg dropped me AND I realized that this road wasn't just going down into Oakridge but was going to dangle around in the high country for a while, meandering through beautiful vista, after beautiful vista. "Just stay on the asphalt and you will be ok" wrote the ride organizer and rando extraordinaire, Michael Wolfe. So I followed. Presently, I came upon Greg, who was helping Ann and Cal fix a flat. They waved me on and so I kept moving and was soon caught again by Greg. 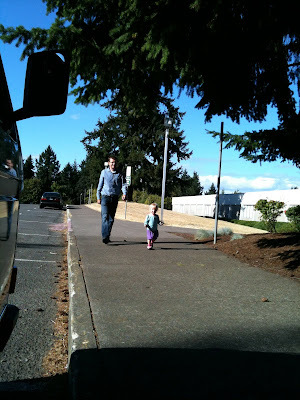 We rode into Oakridge together, caught Geoff, and enjoyed a little of the wine festival going on in downtown Oakridge. I picked up a brownie from a bakery, and then felt the need for salt and a Flame Thrower Burger and Dairy Queen. Geoff and Greg rode on, I think to the McDonalds, never to be seen again. While in Oakridge, I took some time off, read the paper, ate at a leisurely pace, and enjoyed the town. Oakridge has set itself up as a mountain biking mecca and features hundreds of miles of single track. I think that I might like to broaden my cycling exploits some day and this might just be the ticket, my predilections of riding to the ride notwithstanding. After Oakridge, I came upon Westfir which featured a covered bridge, which though tangential to the course, necessitated a crossing. I don't think I had seen one since I lived in Indiana so it was a real treat. After Westfir, I kept riding up NFD 19 (the one into Oakridge was 21 and 22 I think), where after 20 miles, I came upon Michael Rasmussen manning a control. Michael has a wonderful, zen like quality that instantly put me at ease. This stop also featured reuniting with Greg, who had missed the control and ridden back. I found out that we were two hours behind Strong and the crazy fast dudes, one hour behind Beebe and Prince and about half an hour behind Swarts. Greg took off to try and catch Swarts and I hung around a little and talked about Veloquent and how fantastic Kent Peterson is. I rode up NFD 19, which Greg promised was much easier than the previous, (he was right) and then caught him at the top, where he was putting on clothing for the descent. I already had all my clothes on so I just had to ride with what I brung, which was three jerseys, two of which were wool, short nylon bike shorts, wool socks, SPD sandals, fingerless wool gloves and perhaps a wool hat. No, the hat was in my drop bag. Drat. Greg was great riding company as he has many great stories to tell and that guy climes like a mountain goat. I recommend riding with him if you can keep up. We rode down the hill and then to the Cougar Dam which I wish I could have seen in the daytime, and then onto HWY 126 which seemed like I had just come into civilization for the first time since Cottage Grove. The control was at the intersection of Hwy 126 and 242. Hwy 242 was one of the selling points of this ride but it was closed due to forest fires and we could smell the smoke even from the bottom of the pass as we pulled in. Fire trucks were passing us on a regular basis and the camp where the club rented for the night was also a staging area for the fire fighters. Greg and I got in at around 11:30 and I was doted on hand and food by my fellow rando club members who were ready with all kinds of food and drink and conversation. I first went for the shower and Greg did the unspeakable and just got a snack in order to ride on to Detroit Lake, the new control ending. Because of the road closure on 242, there would only be 4 passes instead of 5 to cross this ride and we would cruise up to Detroit Oregon, get a signature, and then ride back to NFD 11/Quartzline road. I wasn't complaining as I was pretty happy with my performance so far, but I love riding from east to west over the Cascades because the climate is stark. On the west it's lush and verdant, and on the east the air changes to that of my childhood memories. Someday, I will ride the Blue Mountains 1000/1200 and ride through my early childhood memories but this ride was for my blossoming. It is the land where I lived from 16-21, where I came upon my own, where I became Brad. Meanwhile, Thorvald and Astrid have been abducted by two people I've never seen before. I'll have to ask Claire about that one! Here we have a fantastic rand buddy on the left at Vincent Munoeke on the right. Vincent had just ridden the SIR 1000k the weekend before and then did this route as a pre-ride on Tuesday and Wednesday but got to include McKenzie Pass (242, before it closed on Thursday), and was thus helping out at the overnight. That guy has a seriously iron posterior! I was awoken at 3 and after 3 hours of sleep, I felt surprisingly refreshed. I would have preferred to sleep in more and see more of the mountains in the daytime, especially the lava beds on 126, but I also had to get back to Lebanon, hopefully soon after church for Claire and the kids, so that they could nap as much as possible on the way back to Seattle, thus I was a man on a mission. Geoff had taken an hour break and was eating at midnight and riding through as I was about to go down, and David Strong, pictured above, had gotten in at 9:30 and was headed out a few minutes behind me. Mmm, and extra 2 hours of sleep, I'm so jealous! Just look at how refreshed David is right there! Must pedal faster next time, must pedal faster! Also prepping as I popped out the door was Eric Ahlvin. As I watched him don his many layers, I thought, "hmm, I should take my rain coat for the early cold hours and perhaps for the downhill off the pass." That, my dear friends, was the best decision I made all ride. It was in the mid thirties until after dawn and the downhill was so cold with the wind chill that I thought seriously about Jack London and his short story "To Build A Fire" where the risk with the cold is that you will just go to sleep and never wake up. Chilly. After getting some nice things into my stomach, handed to me by a cheerful and willing control volunteer, and discussing with Steve Barnes how he was going to meet me in Lebanon and abandon the ride. Back up, I had set up with Steve to take him back to Seattle at the end of the ride. I had also agreed that I would try to be back and finish the ride by 2 PM so as to coincide with church schedules of loved ones and napping schedules of my kiddies. Unfortunately, this is my view of the lava beds. 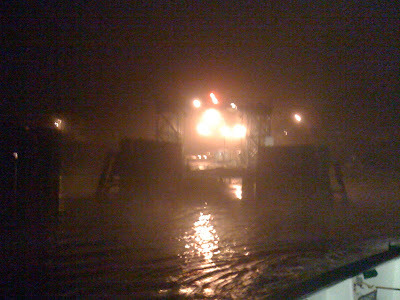 It's also more or less the view I had of the Cougar Dam. I love Randonneuring but this ride had been set up by me for minimum time allotted. Touring with camping gear is a competing and sometimes more compelling way to travel for me. There is no clock except for the possible ferry departures (we have lots of ferries around Seattle), and nobody gets dropped. 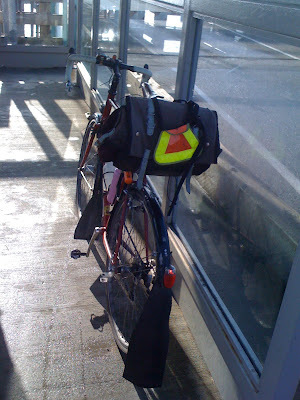 Rando has a different quality in that it is still bicycle touring but for people who have jobs. Thus there is a clock that ticks and prods you on. There is expectation. There is competition, with others, and with yourself. I was going as fast as I could muster and keeping the stops as short as possible given that this was my first 600k, I hadn't really consulted the route profile except that I was expecting to go over the Cascades somehow. Susan laughed at me early in the ride for not investigating the route more thoroughly. I rather think that the mental preparation and worrying about the extra climbing would have added to the fun and to the expectation, the best word I can come up with that catches the feeling is German: Erwartung. Events are so much sweeter when you can mentally prepare, fear it, feast upon that Erwartung! But you should know that I had a ball on this ride. At no point was I thinking of bailing out. At no point did I hurt more than I could handle, though Eric's double shot of Alieve really helped my aching knees at 4:30 on the 126 when he caught me. Thank you so much, Eric. You really made those night time climbs more bearable. Got into Detroit around 8, realized I had done 50 miles in something like 5 hours, wondered to myself what I had been doing that morning, realized that Michael Wolfe was right, 150 miles in this terrain was not conducive to a 2 PM finish time, texted Claire with the news that I would be late and perhaps very late since I had to climb back up from Detroit and then do another NFD pass (like a pass on steroids, I tell ya! ), and then got to work. The out and back to Detroit was really nice as I got to see so many fellow riders and the camaraderie was exhilarating. From Strong and Shopland, to Olson, then Ahlvin, Sikorski, didn't see Swarts. 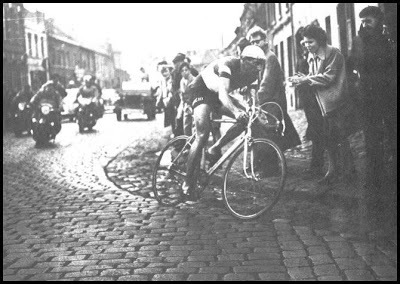 Swarts was riding straight through because he had to ride to the coast by nightfall or something like that. Olson had a hotel room in Detroit and Shopland had ridden through that night because, get this, he was slowing down and not feeling good. Of course, only in rando world would that be the normal course of action. Then on the way back, it was Trason and Anderson, then Beebe and Prince, all of whom had arrived at the overnight before me, then Peg, Winczewski, Susan and others whom I hadn't met. 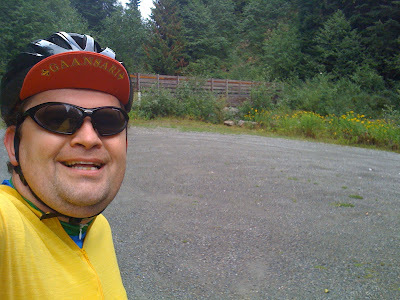 I was heartened to see Steve at the Quartzline Road turn and let him know how the route went. This was also his first 600k and I like his approach to riding. See blog link above. So these NFD's are also called Backcountry Byways, and have information kiosks along the way to guide you along and give you some sense of the area and history. Dorena (NFD 22) was well thought out and informative, Aufderheide (NFD 19) was pretty, with woodcut map, but I had forgotten to photograph these kiosks. Imagine my joy at seeing a sign for the last kiosk: Quartzline Road. Well, the above is what was left of this one. Look closely for the shotgun blast in the middle of this kiosk. Hell ya, baby, we were headed into redneck country! I kept riding up the road and heard gunshots in the distance. This, along with two stroke engine sounds would more or less accompany me for the rest of the journey until we got out of the mountains. The character of this road was very different, perhaps owing to it being much closer to cities in the valley. Heck, the people need a place to recreate, and these are some pretty nice places. This next photo is designed to punch a hole in the Church of Low Trail. This is me taking a picture while cruising through the mountains, while eating a sandwich with 8-10 lbs in an Ortlieb handlebar bag suspended off a second stem (under the steering stem) on a high trail (68 mm) Surly Cross Check. It may not be as perfect or as refined as frames costing 2-10 times as much but I love this little bike and I'll keep riding it until it cracks or I crash it. 2004 red color for me. I got to the top and decided to enjoy the last of my breakfast, consisting of a ham and cheese sandwich, a reuben, and two 16 ounce cans of pop; one Mountain Dew (when in redneck land....) and one of Dr Pepper. I choose these drinks because of their caffeine content but also because of the extra-culinary associations I have with them. Dew reminds me of southern Indiana where I went to grad school and where I dated a girl from West Virginia. She was a potter and we would go out down the back roads were she would photograph garbage and I would delve into my new passion bluegrass cello. Pepper comes up because I played a series of fairs with Barry Manilow when I first moved to Seattle and he wrote perhaps the best jingle ever for a soda: "Be a Pepper", well that and "I'd like to buy the world a coke". I wasn't sure about that gig when I took it but Mr. Manilow is one of the most consummate musicians I've ever met and I'm glad I met him. This is the view northward, fairly close to the aforementioned shooting sounds. Sure, it's scarred by logging, but how else are you going to build your house? Sure I live in a concrete condo, but wood seems like a pretty good building material even if it now comes mostly as chipboard. The downhill after this shot was so perfect, so dreamy, so carve-able, so perfectly set up on the warm side of the mountain, with the uphill on the right so that I could cut the lefts as well as the rights for a racing line, and I whooped and hollered all the way down. Only the occasional oncoming motorcycle broke me from my reverie. It was just a dreamy, fast descent and I have a word about the perfect tires for this section. Schwalbe Kojaks. Mine are the 35 mm size (700c) and those tires stick like glue. The ride much more quietly than Paselas and I can run them down into the 30's for tire pressure unless I'm riding in town where the extensions are abusive to say the least. Get some if your bike will take them, and enjoy. Now trouble. I caught Ian. This is not good because Ian is fast. He was accompanied by the above pictured Eric. It turns out that Ian's tire washed out on a slow leak around a corner and he crashed. I never know what to do in these instances and sort of hung back but with Eric nursing him into the control, I chatted a little and then expected them when I got in. They came and Ian sat down for a while to figure out what to do and whether to continue. That guy had also done the 1000 on the prior weekend and had ridden through the night so I didn't know what to figure. 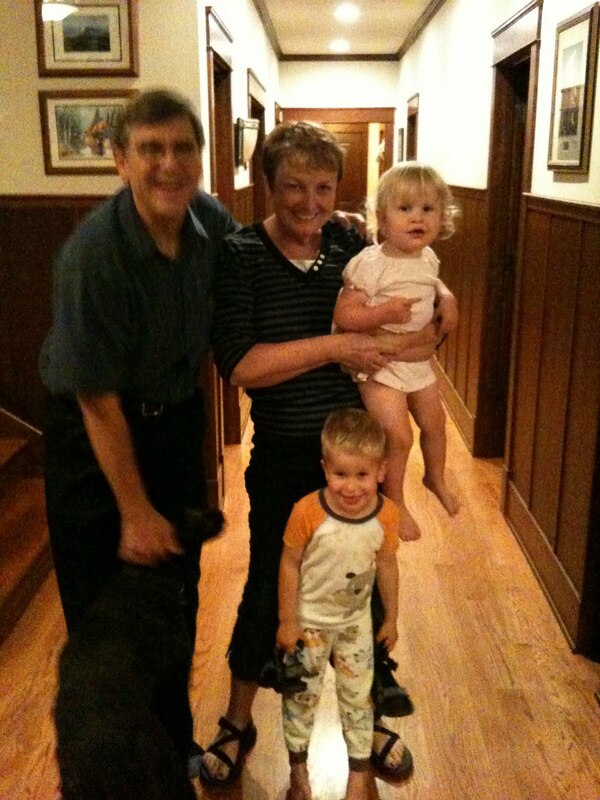 Eric and I continued on and Ian stayed with Wolfe's parents. He was in good hands. And it turns out that Ian finished the ride less than an hour after we did. That's serious rando! Eric and I rode in and starting pounding away, smelling the barn. We made one wrong turn where we didn't believe that Northlake was Lake Drive and ended up on Hwy 20 before turning around and twice passing two guys in a big truck and camo but with a flat tire that they didn't seem to have the tools or wherewithalto fix. But during the rest of the time, Eric regaled me with tales of teenagers, the beauties of Co-Motion aluminum racing bikes (who would have thought? Aluminum, a hiss and a byword of frame materials among the randonneuring set), and a life well lived. He rides a bunch of different kinds of bikes and it spurred me on to thinking of getting into BMX freestyle. What can I say, I've always wanted to try. Nothing too big, just tricks and drops and urban goofing off. We'll see. We passed hundreds of people enjoying this next Willamette headwater, most of whom looked like they could use a bike ride. Lots of very large trucks made their way past us and we eventually came into the valley. On the cue sheet was hill marked with "Sorry" on it. It was late in the ride but because it seemed so menacing on the sheet, we made short work of the hill once we got there. Here is Erick attacking and destroying said hill, that seriously, didn't need the adjective, but it was fun to pass. I'm a total fan of editorial comments on my route sheets. They really color the experience and provide, like a ride report a more full understanding of what you are going through. Way to go, Michael, keep it up. but I didn't have to because my whole family came to meet me, with Thorvald asleep in the van, and my one year old daughter was happy to see me, wait, the photographer, Claire, oh, she was happy to see me too. They are such a joy. Now, how to get the whole family on a brevet......... Oh yeah, that's why there's bike touring with camping. How soon I forget. Only $10 to join, $80 for the ride, and look at all the fun you'll have! Besides run-ins with cars, I have been up to some very positive developments recently. I've dropped some serious weight in the last few months. Serious weight. On November 5th, I weighed in at 230 lbs or 104 kilograms, or better, 16 and 1/2 stone. Today, February 24th, I weigh 195 lbs or 88.5 kilos or best, just under 14 stone. That lovely lady beside me is not Claire, mind you but Robin Lee, cyclist extraordinaire. Don't we have cool helmets? Come on Nutcase, we want sponsorship! But here, I'm around 203 lbs so it's not entirely representative. No, this is better this shot was taken up on Orcas Island last week to give you better perspective. Incidentally, this photo features my Valentine's Day present which is a "keeper" ring to hold my now very loose wedding ring on my finger. So yes, this weight loss is showing up all over and in many facets of my life. There are all kinds of reasons for this weight loss. I was tired of breaking bike parts: two cranks, three pedals, one handle bar, numerous chains, rear wheel damage,.... the whole kit and kaboodle. I was also tired of being a slow climber and weighing 40% more than the average bike racer my height wasn't helping me get to the top of anything. I was also phenomenally impressed with my wife, who after two kids is magically down below her pre-wedding weight and, though I won't tell you where she's at, looks FANTASTIC! What can I say, I don't want to look like the odd couple. Even more than that, I got some pretty serious scares and scars last year, I was in the emergency room 5 separate times last year. Once for a fall that gave me a wicked scar on my abdomen, and four times to treat the case of MRSA that erupted from said visit, or as the doctors say, possibly from anywhere. I understand plausible deniability. No, the truth is that with some pretty damning photos that I saw of myself, in conjunction startling health data I received auxiliary to my ER visits, I decided to get in the saddle and move everything southward. There was no reason why a guy who bikes ~120 miles a week pulling kids and cellos should weigh that much or more importantly, test that high. My glycemic was 106 and my cholesterol was 204 (but down from 225 four years ago). It was time for an intervention. So here I am. I've lost 35 lbs in in just under 4 months. It feels pretty darn good. I've dropped from a very tight set of 38 inch Levi's to a new, comfortable set of 34's so I reckon I'm down about 5 inches in the waist department. I had to get rid of pair of pants in the process and now only the suit I bought in 1996 fits me. Everything else just hangs and I'm afraid to try on any of my tuxedos. Fausto Coppi and I are the same height.